Whilst his turntables stayed well and truly grounded on this occasion, Angelo took to the skies (15,000 feet to be exact) armed with a iPad Mini and djay 2 in an attempt to become the first DJ to perform live in mid-air! djay Pro - More Music. More Power. 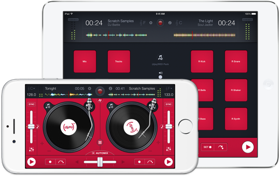 We have partnered with the App Store and (RED) to bring you an exclusive (PRODUCT)RED™ version of djay 2 for iPhone and iPad. Available for a limited time only, this version contains a free (djay)RED skin as well as an exclusive (djay)RED sample pack available via In-App Purchase. From now through December 7, 100% of the proceeds when buying djay 2 or any of the (djay)RED In-App Purchases go to (RED)’s fight against AIDS. Stand with us, App Store, and (RED) to fight for an AIDS FREE GENERATION. 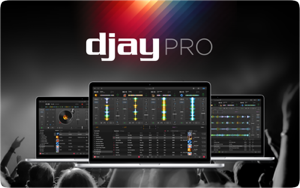 Get djay 2 on the App Store today. DMC Champion DJ Rasp performs with Algoriddim’s djay 2 for Android using a Reloop Beatpad controller and a Google Nexus 7 tablet. djay 2 is now available on Google Play and the Amazon Appstore for a special limited time introductory price of $2.99. We are excited to announce that the next generation of the world’s best-selling DJ app is now available on Android.